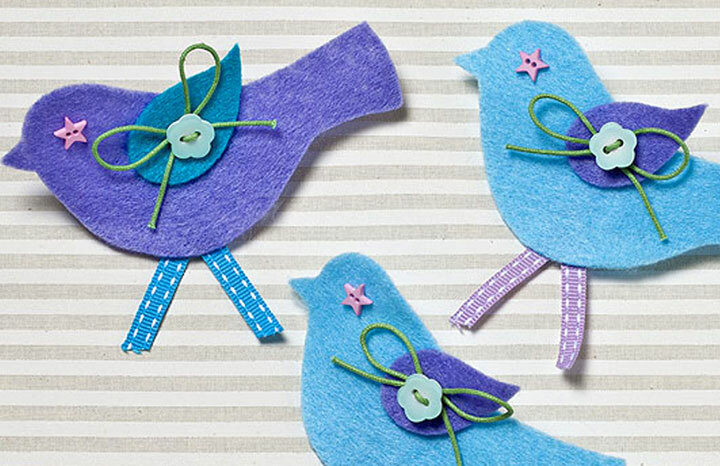 Using the template (download yours here), cut out two bird shapes from a piece of felt. Cut out a contrasting colour ‘wing’ and stick to one of the bird pieces. Thread a piece of cord onto a flower button and tie a bow. Stitch the flower button to the wing and a star button ‘eye’ on the birds’ head. Cut a small length of ribbon, fold in half and stitch to the back of the bird to make the ‘legs’. Then stick the two bird pieces together. Finally, sew a small bar brooch on to the back of the finished bird. Project from the Hobbycraft blog.